Artistry in the group ring at 13 months old. "Artistry" made her ring debut on the January 2007 Florida Circuit at 9 months of age. She won Best of Breed over specials her first time in the ring and finished her championship ONE month later with another Best of Breed over 6 specials. She completed her championship exclusively from the Bred by Exhibitor class. She won 2 MORE Best of Breeds and a Group Fourth in her first two shows as a move up special. She is a specialty Best of Breed winner at the Hudson River Valley Hound Association. We consider her one of the Whippets that comes closest to our interpertation of the Whippet standard in almost 40 years in the breed. She was ranked #5 Whippet in the Country as of May 2007 (Canine Chronicle). 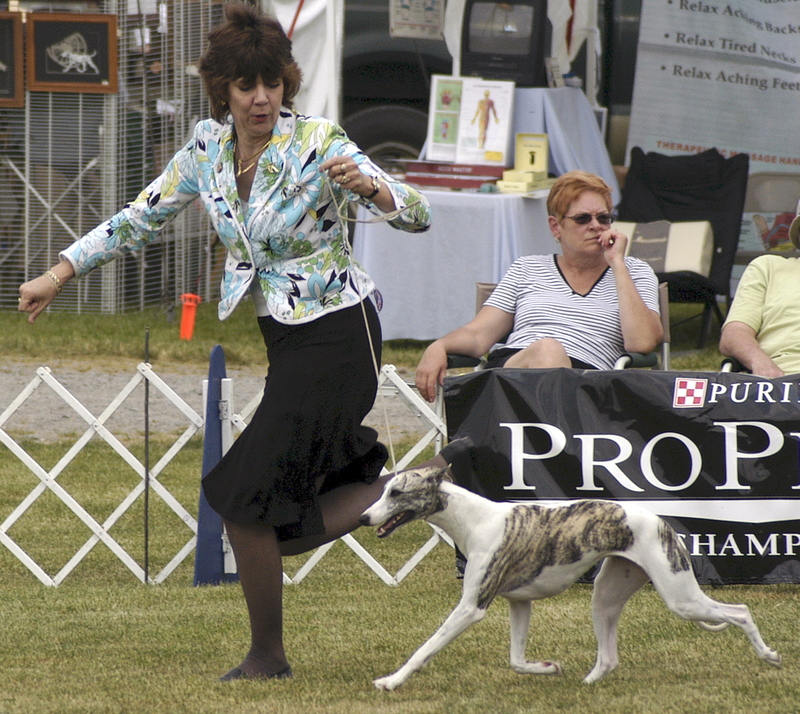 She ended up a Top Ranked Whippet for 2007. She is NUMBER ONE WHIPPET IN THE USA FOR 2008!!! (CanineChronicle/AKC All Systems). Artistry is owned by Kerrie Kuper and Neil Barthelette and is co-bred by Kerrie Kuper (Karasar Kennels)and O. Light. &COPY All images, page content, and source code is copyright 1998-2009 by Mary Alderman of Webpages By Design.